WASHINGTON — While being questioned by Democratic New York Sen. Kirsten Gillibrand on Thursday over his position on women and open homosexuals in the military, Trump’s Secretary of Defense nominee, James Mattis, said that he has “never cared” about the sexuality of those in the Armed Forces and has no plans to overturn policies allowing them to serve. “In your book ‘Warriors and Citizens,’ and the interviews you did afterwards, you said in recent policy debates such as those about allowing homosexuals to serve openly [that] you believe that ‘the American public is not nearly as concerned as it should be that the changes to military policies are accruing risk to our forces,'” Gillibrand noted, quoting from his publication. “We fear that an uninformed public is permitting political leaders to impose an accretion of social conventions that are diminishing the combat power of our military disregarding our war-fighting practitioners advice,” she read. 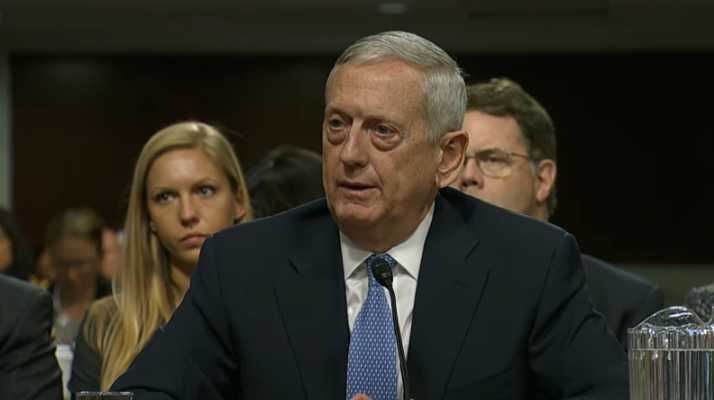 Mattis replied that he believes the focus needs to be on making the U.S. military as strong as possible, and that he has no plans to repeal any current policies. “Senator, my belief is that we have to stay focused on a military that is so lethal that on the battlefield it will be the enemy’s longest day and their worst day when they run into that force. I believe that military service is a touchstone for patriots of whatever stripe,” he said. “It’s simply the way they demonstrate their commitment, and I believe right now the policies that are in effect—unless a service chief brings something to me where there has been a problem that has been proven—then I’m not going in with the idea that I’m going to review these and right away start rolling something back,” Mattis advised. He replied that his concern is not in regard to the sexuality of those who serve. “Frankly, senator, I’ve never cared about two consenting adults and who they go to bed with,” Mattis stated. “So the answer is no?” Gillibrand asked. Mattis also advised during the questioning that he has no plans to oppose women serving in the military. As previously reported, Mattis had formerly questioned whether women are suitable for carrying out the “intimate killing” required in ground combat.